1" Polyester Satin Tufted Bench Cushion - CUSTOM SIZE - Free S&H is rated 3.62 out of 5 based on 8 ratings. This page is for customers who'd like a specific custom cushion size. If you'd like 14" x 25", 14" x 28", 14" x 30", 14" x 32", 14.5" x 33", 14.5" x 35" or 15.5" x 32", you need to go to item # 30075. Our custom tufted cushions are identical to our other tufted cushions. Made of soil and stain resistant polyester in your choice of 13 colors. Currently, the maximum width is 19.5" and the maximum length is 86". 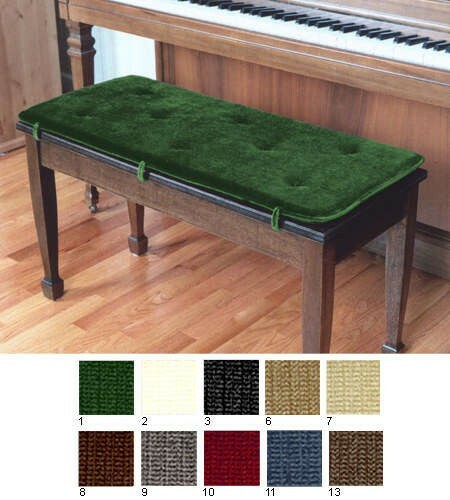 Each 1" tufted piano bench cushions has 8 sewn tufts (no buttons) and 3 ties on each side so you can attach the cushion to the lid of the piano bench. Soil and stain resistant, if the 6 ordinary sizes are not right for your needs you can enter your custom dimensions on this special page. Please note, our price of $129 for a custom satin polyester cushion is provisional, depending on your required dimensions. The reason for this is that each custom cushion requires considerable extra time and operations such as marking and cutting the foam to a special size, creating a pattern, cutting time becomes individual, every procedure that we normally do for stock sizes has to be re-created for a one-time size. We will happily provide an email quote, and if the price is going to be higher than $129 we will notify you before finalizing the order. Custom size cushions are not refundable or returnable, so measure carefully!